I'll try it out ASAP! Thank you very much Daniel!!!! Silly question. 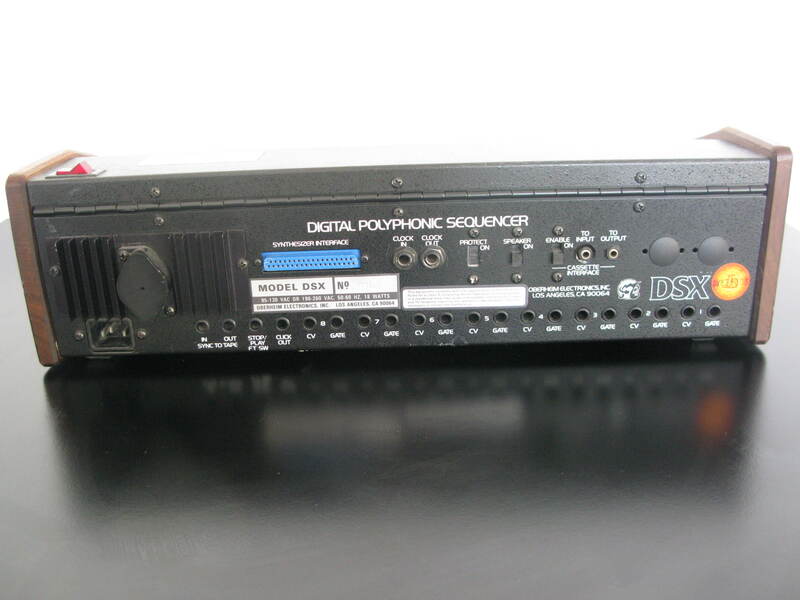 I was wondering if DSX hack can be used for regular OB synth use along side CV use. Meaning, can I use the program to input sequences/noted to be played back on my OB-8? the reason I ask is inputing everything via OB-8 can sometimes be inconsistent or unreliable. Yes - you can specify whether or not the note information is sent out to the CV outputs, or to the connected Oberheim synth (and as noted above, the most recent version allows this to be done on a per-Track basis, as opposed to globally in the original 1.0 version). Best thing to do is try the demo version to be sure it does what you hope to do... It's a crippled version in that it doesn't allow Merges and only 4 notes on one Track, but it will let you see if the workflow you're looking for is supported. I will probably buy it no matter what. The fact that it's not limited to CV use is spectacular... but I was pretty sure even if it was that after dumping the data one could always switch the track out of CV mode. One last question. My DSX is one of the last production models with all the "updates". It has the last version of the board and midi holes (unused) punched in the back. comparing this to another I had the boards were different. any chances of mine being unsupported. These things are quirky indeed. And secondly. I've notcied that the CV out on my DSX is WAY out of calibration for scale and tune. Do you know a good person to have this calibrated repaired? I assume without an OB to test it with It might be hard to get it working right. Yes - you can always convert a track from CV to Obi or vice-versa on the DSX itself. No idea re: whether your model would be unsupported (never heard of one with punch outs for MIDI? ), but my guess would be that if it's using v3.x software, it should work fine. Again, try the demo first to be sure. Re: calibration - you probably don't need a tech. There's two trimmers on the inside to adjust the octave range and the offset (not sure if those are the technical terms, but that's how I think of them). This reminds me that I was going to write a post with pictures about it, but I never got to it... Will try to when I have time. Yeah, I fiddled with the trims a bit and couldn't even get it close. I need to sit down with the service manual and go over it in earnest. You know what - I never really noticed before - mine has the same punch outs now that I look! Re: the trimmers - I used a digital voltmeter (nothing fancy), and measured voltages when programming specific notes (a series of "C"s). Each octave should bring you up 1 volt, with the bottom C at 0 volts. First adjust the trimmer that adjusts the octave range - for each octave jump, you should see a 1 volt increase. Then adjust the offset trimmer so that C's fall on 0, 1, 2, 3, etc.. volts. You may need to repeat the above process iteratively to get it perfect. I just hade the chance to test things out with the new 1.1 version and I've discovered that multiple voices (polyphonic) assigned to one track OBXa doesn't work. Instead the play one note at a time with last note priority. Also the tempo doesn't seem to be written to track 0 on the DSX (it just play the tempo set by the DSX itself). Have you had a chance to test 1.1 it against an OBxx synth? I don't have the ability to test against an OBxx synth, as I don't own one. With regards to the tempo being written to Track 0, in my experience there are times where for some reason when loading from cassette, the tempo information is not read. As a test, try completely clearing your DSX of all sequence info - Press Edit, then 4, then Erase. Then try and send the info from DSX Hack again. Also be sure that the DSX is set to "listen to" Track 0 once transferred from DSX Hack. I'm not in front of the DSX now, so don't remember the exact keypresses, but hopefully you know what I mean. I tried the "clear all sequences" trick yesterday but that didn't work either for some reason. The tempo per sequence (track 0) would be great to have if you merge several sequences with tempo changes together. I'll dump a OB-Xa polyphonic sequence for you tonight, to which email address? Are you sure that you have Track 0 set to ON on the SELECT PLAY TRKS page? Please send the dump to dan@defectiverecords.com . The sequence should be as simple as possible, ideally like just two notes held down at the same time. I've just emailed you two different dumps of OB-Xa recorded Poly Sequences. BTW I got the tempo on Track 0 to work. Perfect, thanks Peter - I received the dumps. Won't have time to look till probably the weekend, but will report back to you. And cool on the Track 0 stuff, glad you got it sorted! Apologies for the long delay - I finally had a chance to look at and decode the files you sent Peter. Thank you, they were helpful. Hi Folks, Any recommendations for a decent, low-cost (not freeware, please) DAW that is known to work well with DSXHack? Sonar? Thanks in advance for your comments. Something more specific to the DSX, but with implications about how DSXHack interacts. I may be overthinking DSX protocols, but when I record patch changes on Track 0, can I assign different OB8 patches for each track. That would mean that the DSX would have to tell the OB8 that there is up to 8 different patches, say, one for each of 8 voices? There is some mention in the DSX manual that the most a DSX can do is play two patches ONLY by selecting a split, and then there are 8 CV/gate outputs. Re: suggested DAW - really anything that outputs MIDI files will suffice! Re: your 2nd question - not really sure of the answer, but know that DSX Hack currently does NOT encode any patch information on Track 0, it was one of the things that got left out of my decoding efforts unfortunately.